Peace, relaxation, solitude, luxury, with only the breeze or the cry of a soaring hawk to break the silence … all surrounded by a 100-acre nature preserve with turkeys, deer, and even an occasional bear. Just seven miles from the center of eclectic and historic Asheville, North Carolina, and close to a host of Western North Carolina attractions and activities. This 3,200 square foot home perched high on the side of a mountain at the end of a pristine forested drive offers stunning panoramic winter views and spring and summer views as well through the lush curtain of leaves from hardwoods standing as sentinels of your privacy. A uniquely constructed home of wood and rock that seamlessly blends with its mountain environment, the home features a 22-foot-high cathedral ceiling, two large stone fireplaces, and includes all the usual amenities plus a 6-person hot tub on the deck, broadband Internet, a CD/Tape/Radio sound system throughout the house and unlimited U.S. long distance calling. Completely furnished, it will comfortably accommodate 10 people. 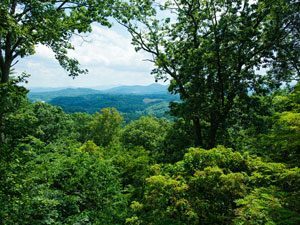 Peace, relaxation, solitude, luxury, with only the breeze or the cry of a soaring hawk to break the silence…..all surrounded by a 100-acre nature preserve with turkeys, bob cats, deer, and even an occasional bear. Just seven miles from the center of eclectic and historic Asheville, North Carolina, and close to a host of Western North Carolina attractions and activities. A uniquely constructed home that seamlessly blends with its mountain environment, the home features a 22-foot-high cathedral ceiling, two large stone fireplaces (one in the living room and one in the master bedroom), and includes all the usual amenities plus a 6-person hot tub on the terrace, broadband Internet, a CD/Tape/Radio sound system throughout the house and unlimited U.S. long distance calling. Completely furnished, it will comfortably accommodate 8 people. The oversized master bedroom on the first floor has a king bed, 32” flat screen TV, reclining chair and stone fireplace. The master bath features a sunken tub, a separate porcelain tile shower and two sinks. The second bedroom features a queen bed. The second bathroom has a shower and a single sink. The third bedroom is furnished with two twin beds and is in the loft overlooking the living room. The living room has a 37” flat screen TV, DVD, stone wood burning fireplace and sleeper sofa. Several sliding glass doors allow easy access to the deck. The master and second bedroom has long range mountain views. All linens and towels provided. 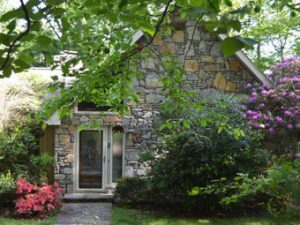 Enjoy the beauty and serenity of a lakefront home nestled in the woods of Western North Carolina, a mere six miles from the main attractions in and around the City of Asheville. Comfortably sleeping eight in four spacious bedrooms (one master with a King, and three with Queens) this home away from home is perfect for family gatherings. Newly decorated to meet the demands of function and good taste, you will find all of the conveniences of a luxury vacation rental. The living room is equipped with a fifty-two-inch flat screen TV, a state of the art entertainment system, and a logged gas fireplace. Flat screen TVs are in all of the bedrooms. Cable and internet are provided. For some extra needed privacy, retreat to a private office with computer and printer. No amenity has been spared in a roomy kitchen that is equipped with a gas stove and oven, an electric oven and two microwaves, and a large center island table that seats six. Should you find in-kitchen eating wanting, step through to the separate formal dining room that seats 10-12 and has its own gas log fireplace. From the dining room or living room walk through sliding glass doors onto a welcoming porch with chairs for conversation, book reading, or a nap. Just beyond the porch meander through a tastefully landscaped yard, at the end of which is a deck overlooking a one acre spring free lake stocked with Bluegill, Smallmouth Bass, and Catfish. 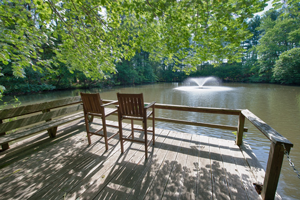 Sit on the deck and appreciate the sights and sounds emanating from the fountain at the heart of the lake. “Catch and Release” fishing is permitted, no license required. Although swimming and boating is not permitted, a jacuzzi overlooking the lake that seats 4-5 makes good consolation. Grills are provided for afternoon and evening cookouts. Or if you just prefer to huddle around a fire on a cool Western North Carolina evening there is a gas fire pit in the backyard.